This guide is intended to help you do the most common Observu actions the first few times. Each Monitor collects measurements on a single object, e.g. one URL or server. Conceptual unit that can have multiple monitors. For example, a service could be your website with several URLs and it's servers as individual monitors. something a monitor can measure. e.g. the response time of a HTTP request. A message about an event sent to a contact using e-mail/SMS/a phone call/etc. You can either add a monitor using the monitoring dashboard or have it set up automatically when you install our software on your server. To add a monitor from the dashboard click on the Add New Monitor button on the right. You can also select it at the bottom of the monitor selection dropdown menu. Now choose the type of monitor you want to add and fill the fields that appear accordingly. Now continue by submitting the form. 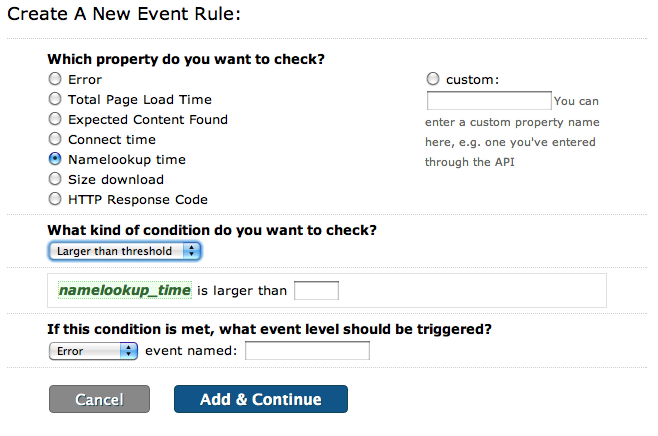 After a few seconds you should be redirected to the page where you can set event rules. Most of the time, you can skip this step and continue. You may also want to slightly adjust the rules that are shown, e.g. change the threshold values a bit. 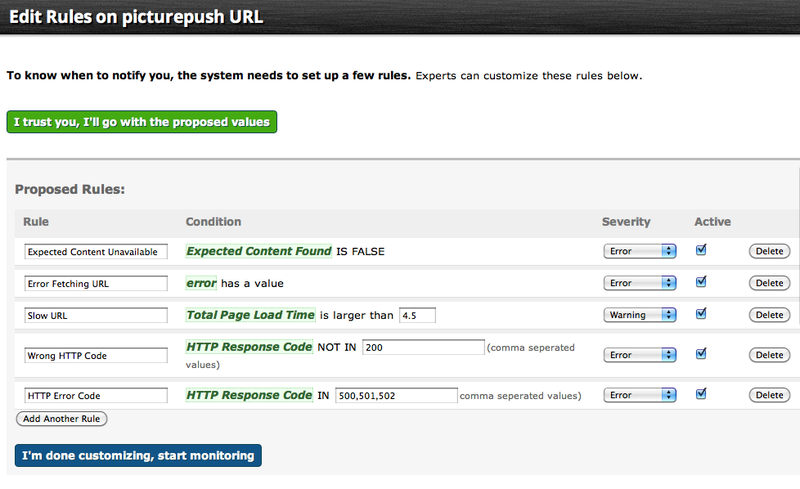 After confirming the event rules, you will be redirected to the page that shows results for your monitor. As you've just created it, there is no data yet. We recommend you wait a few minutes and refresh the page to see you're first results. In the mean time you could also continue adding more monitors. The Observu Server Monitoring Agent collects information on your server. To do so, it needs to be installed as a daemon (service) onto the server(s) you want to monitor. Currently this daemon supports Debian and Fedora based Linux distributions. This should install the daemon and prompt you for details to let the daemon connect to the Observu servers. If you\'ve already created the monitor in the Observu monitring dashboard, you can immediately paste the API key in here, otherwise you can enter a monitor and service name, followed by your Observu username and password. 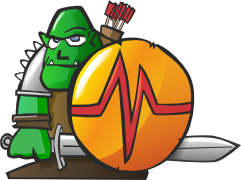 When properly installed, the daemon should list on the monitoring dashboard and start showing collected monitoring data within a few minutes. Note: This installation procedure will automatically try to install dependencies and provides an interactive configuration tool. In case you do not like this, or are looking to automate installation, please have a look at the server cluster monitoring documentation. There are two ways to set up notifications: either for all monitors at once or for individual monitors. To set up a baseline of notification rules that can be triggered by all monitors go to Notification Rules from the dashboard or the Settings page. To create a new rule, click 'add another rule'. 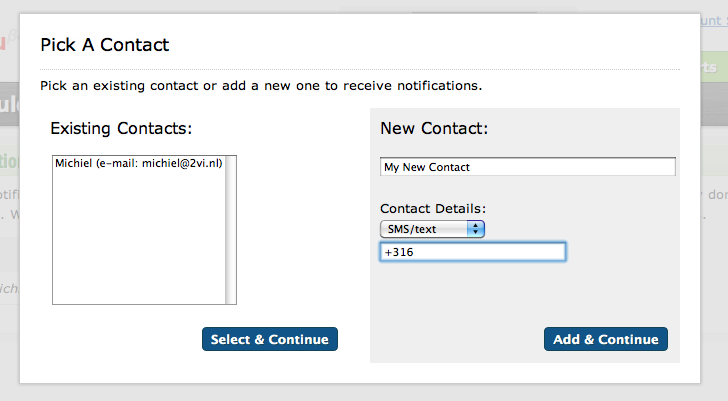 Now add a new contact by entering a name, type of notification and either an e-mail address or phone number. This will add a new notification rule to the webpage. You can customize, by selecting a minimum priority, the duration after which it should be send and when a reminder should go out. Finally, make sure to hit the save button at the bottom to make your changes permanent. In a similar way you can set up notification rules specific to services and/or monitors. Observu comes with a number of default event rules. Some of these rules have parameters like the maximum amount of time a page may take to load. You can easily edit these parameters on the event rules page or change the priority of the event that is triggered. After you've changed the paramers, make sure to hit the Save button at the bottom to make the changes permanent. If the default rules are not enough, you may specify additional rules, by clicking 'Add another rule'. You can pick one of the proposed properties or enter a custom property name. (e.g. if you entered a custom named property through the API) Now select a type of rule and fill in the required parameters. After defining the rule condition, enter a priority and name for the event that is triggered by this rule. There are all kinds of reports that can be displayed. The easiest way to get started is to go to the 'Reports' section, click one of the standard monitoring reports and then modify the search criteria to fit your needs.